Public presentations of the AppHub team will be published here. Come back soon. Apphub demonstration in the TechTalks session by Stéphane Laurière, OW2 CTO, Thursday April 28. At the Paris Open Source Summit, the AppHub project was presented by Peter Deussen, Fraunhofer Fokus and project coordinator in the European Collaborative Innovation session. This session offers a selection of state-of-the-art project presentations to illustrate how multinational partners leverage open source to help shape the future of the IT industry in European publicly-funded collaborative innovation programs. During Cloud Forward in Madrid, the AppHub project organized an SME training workshop with around 20 professional participants. The following presentation provides recent figures about their cloud expectations, thanks to an online form that was provided before the event. AppHub, the European Open Source Market Place, presentation from Peter Deussen, Fraunhofer Fokus. This presentation was recorded during OW2con'16, 21 Sep. 2016 in Paris Mozilla Space. It provides an overview of the AppHub services offered to open source projects for exposing their outcome to the market, using a template factory for packaging their software, and also for assessing their market readiness, using the Oscar platform provided by OW2. Software packaging is easy with the AppHub project services. Join the European open source market place, its charter, its quality approach and make your software ready to run on any infrastructure! AppHub, the European Open Source Market Place, presentation from Alexandre Lefebvre, UShareSoft. The 2016 edition of Cloud Computing World Expo (Solutions Datacenter Management and IoT World) took place in Porte de Versailles, Paris, 23-24 March 2016. AppHub was showcased on the Open Cloud Village coordinated by OW2 and in the Open Cloud Forum by OW2, a free to attend conference fostering exchanges between open source cloud technologies end-users, experts and integrators. Discover the mission of the AppHub project, the European open source market place, its charter, its quality approach and give it a try! Derived from the AppHub Store developed in the framework of the AppHub European collaborative project, the OW2 Market Place will be open to all OW2 projects. What are the incentives for an OW2 project to join the Market Place? How can OW2 projects become part of it? This presentation covers these topics. The European Commission, together with the Fundação para a Ciência e a Tecnologia organizes the ICT 2015 - Innovate, Connect, Transform, on 20-22 October 2015 in Lisbon, Portugal. 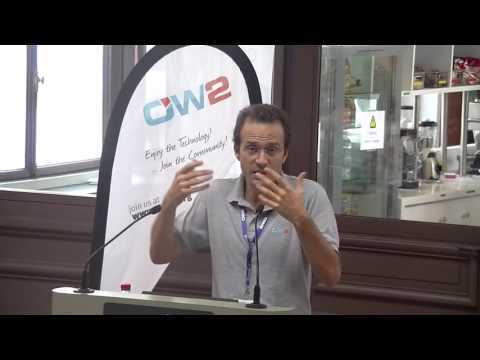 Cédric Thomas, OW2 CEO, Open Source Software presentation, March 25, 2015, Net Futures, Brussels. Use this AppHub Directory Quickstart guide to learn how your project can join the AppHub Directory. Through this guide, discover the AppHub user interface and five easy steps to register you open source project on the directory. First, read the AppHub Directory Quickstart guide. Then, try out the five steps to register your open source project on the AppHub Directory.